When there’s a fire in a high-rise building, safety rules dictate that you don’t take the elevator. You head for the stairs instead. But what if using the elevator could actually be the fastest – and safest – way to evacuate a building on fire? Salamandra Zone is an Israeli startup that wants to make it possible for people trapped in a burning building to flee using the lift. 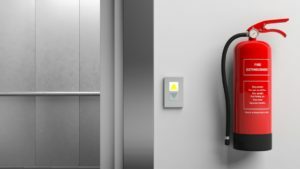 Today, elevators automatically shut off if they detect a fire because the poisonous gases released from the fire can quickly overwhelm the elevator cab. Indeed, some 95 percent of deaths from building fires are not caused by getting caught in the flames but from inhaling carbon-based gases and other byproducts of the fire. Salamandra Zone’s solution: Don’t shut down the elevator. Rather, turn the cab into a traveling “safe room” that can facilitate rescue operations.